Mendelian inheritance[help 1] is a type of biological inheritance that follows the laws originally proposed by Gregor Mendel in 1865 and 1866 and re-discovered in 1900. These laws were initially very controversial. 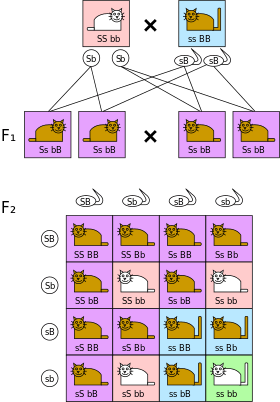 When Mendel's theories were integrated with the Boveri–Sutton chromosome theory of inheritance by Thomas Hunt Morgan in 1915, they became the core of classical genetics. Ronald Fisher later combined these ideas with the theory of natural selection in his 1930 book The Genetical Theory of Natural Selection, putting evolution onto a mathematical footing and forming the basis for population genetics and the modern evolutionary synthesis. The principles of Mendelian inheritance were named for and first derived by Gregor Johann Mendel, a nineteenth-century Austrian monk who formulated his ideas after conducting simple hybridization experiments with pea plants (Pisum sativum) he had planted in the garden of his monastery. Between 1856 and 1863, Mendel cultivated and tested some 5,000 pea plants. From these experiments, he induced two generalizations which later became known as Mendel's Principles of Heredity or Mendelian inheritance. He described these principles in a two-part paper, Versuche über Pflanzen-Hybriden (Experiments on Plant Hybridization), that he read to the Natural History Society of Brno on 8 February and 8 March 1865, and which was published in 1866. Mendel's conclusions were largely ignored. Although they were not completely unknown to biologists of the time, they were not seen as generally applicable, even by Mendel himself, who thought they only applied to certain categories of species or traits. A major block to understanding their significance was the importance attached by 19th-century biologists to the apparent blending of inherited traits in the overall appearance of the progeny, now known to be due to multi-gene interactions, in contrast to the organ-specific binary characters studied by Mendel. In 1900, however, his work was "re-discovered" by three European scientists, Hugo de Vries, Carl Correns, and Erich von Tschermak. The exact nature of the "re-discovery" has been somewhat debated: De Vries published first on the subject, mentioning Mendel in a footnote, while Correns pointed out Mendel's priority after having read De Vries' paper and realizing that he himself did not have priority. De Vries may not have acknowledged truthfully how much of his knowledge of the laws came from his own work and how much came only after reading Mendel's paper. Later scholars have accused Von Tschermak of not truly understanding the results at all. Regardless, the "re-discovery" made Mendelism an important but controversial theory. Its most vigorous promoter in Europe was William Bateson, who coined the terms "genetics" and "allele" to describe many of its tenets. The model of heredity was highly contested by other biologists because it implied that heredity was discontinuous, in opposition to the apparently continuous variation observable for many traits. Many biologists also dismissed the theory because they were not sure it would apply to all species. However, later work by biologists and statisticians such as Ronald Fisher showed that if multiple Mendelian factors were involved in the expression of an individual trait, they could produce the diverse results observed, and thus showed that Mendelian genetics is compatible with natural selection. Thomas Hunt Morgan and his assistants later integrated Mendel's theoretical model with the chromosome theory of inheritance, in which the chromosomes of cells were thought to hold the actual hereditary material, and created what is now known as classical genetics, a highly successful foundation which eventually cemented Mendel's place in history. Mendel's findings allowed scientists such as Fisher and J.B.S. Haldane to predict the expression of traits on the basis of mathematical probabilities. An important aspect of Mendel's success can be traced to his decision to start his crosses only with plants he demonstrated were true-breeding. He also only measured absolute (binary) characteristics, such as color, shape, and position of the seeds, rather than quantitatively variable characteristics. He expressed his results numerically and subjected them to statistical analysis. His method of data analysis and his large sample size gave credibility to his data. He also had the foresight to follow several successive generations (F2, F3) of pea plants and record their variations. Finally, he performed "test crosses" (backcrossing descendants of the initial hybridization to the initial true-breeding lines) to reveal the presence and proportions of recessive characters. 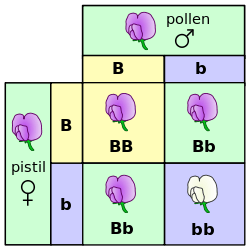 A Punnett square for one of Mendel's pea plant experiments. Mendel also hypothesized that allele pairs separate randomly, or segregate, from each other during the production of gametes: egg and sperm. Because allele pairs separate during gamete production, a sperm or egg carries only one allele for each inherited trait. When sperm and egg unite at fertilization, each contributes its allele, restoring the paired condition in the offspring. This is called the Law of Segregation. Mendel also found that each pair of alleles segregates independently of the other pairs of alleles during gamete formation. This is known as the Law of Independent Assortment. The genotype of an individual is made up of the many alleles it possesses. An individual's physical appearance, or phenotype, is determined by its alleles as well as by its environment. The presence of an allele does not mean that the trait will be expressed in the individual that possesses it. If the two alleles of an inherited pair differ (the heterozygous condition), then one determines the organism’s appearance and is called the dominant allele; the other has no noticeable effect on the organism’s appearance and is called the recessive allele. Thus, in the example above dominant purple flower allele will hide the phenotypic effects of the recessive white flower allele. This is known as the Law of Dominance but it is not a transmission law, dominance has to do with the expression of the genotype and not its transmission. The upper case letters are used to represent dominant alleles whereas the lowercase letters are used to represent recessive alleles. Law of independent assortment Genes for different traits can segregate independently during the formation of gametes. In the pea plant example above, the capital "P" represents the dominant allele for purple flowers and lowercase "p" represents the recessive allele for white flowers. Both parental plants were true-breeding, and one parental variety had two alleles for purple flowers (PP) while the other had two alleles for white flowers (pp). As a result of fertilization, the F1 hybrids each inherited one allele for purple flowers and one for white. All the F1 hybrids (Pp) had purple flowers, because the dominant P allele has its full effect in the heterozygote, while the recessive p allele has no effect on flower color. For the F2 plants, the ratio of plants with purple flowers to those with white flowers (3:1) is called the phenotypic ratio. The genotypic ratio, as seen in the Punnett square, is 1 PP : 2 Pp : 1 pp. The Law of Independent Assortment states that alleles for separate traits are passed independently of one another from parents to offspring. That is, the biological selection of an allele for one trait has nothing to do with the selection of an allele for any other trait. 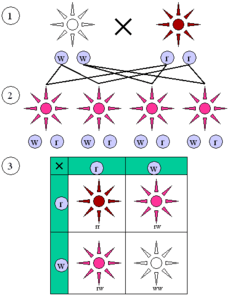 Mendel found support for this law in his dihybrid cross experiments (Fig. 1). In his monohybrid crosses, an idealized 3:1 ratio between dominant and recessive phenotypes resulted. In dihybrid crosses, however, he found a 9:3:3:1 ratios (Fig. 2). This shows that each of the two alleles is inherited independently from the other, with a 3:1 phenotypic ratio for each. Independent assortment occurs in eukaryotic organisms during meiotic prophase I, and produces a gamete with a mixture of the organism's chromosomes. The physical basis of the independent assortment of chromosomes is the random orientation of each bivalent chromosome along the metaphase plate with respect to the other bivalent chromosomes. Along with crossing over, independent assortment increases genetic diversity by producing novel genetic combinations. Mendel's Law of Dominance states that recessive alleles will always be masked by dominant alleles. Therefore, a cross between a homozygous dominant and a homozygous recessive will always express the dominant phenotype, while still having a heterozygous genotype. 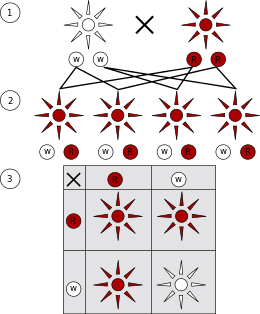 Law of Dominance can be explained easily with the help of a mono hybrid cross experiment:- In a cross between two organisms pure for any pair (or pairs) of contrasting traits (characters), the character that appears in the F1 generation is called "dominant" and the one which is suppressed (not expressed) is called "recessive." Each character is controlled by a pair of dissimilar factors. Only one of the characters expresses. The one which expresses in the F1 generation is called Dominant. It is important to note however, that the law of dominance is significant and true but is not universally applicable. According to the latest revisions, only two of these rules are considered to be laws. The third one is considered as a basic principle but not a genetic law of Mendel. A Mendelian trait is one that is controlled by a single locus in an inheritance pattern. In such cases, a mutation in a single gene can cause a disease that is inherited according to Mendel's laws. Examples include sickle-cell anemia, Tay-Sachs disease, cystic fibrosis and xeroderma pigmentosa. A disease controlled by a single gene contrasts with a multi-factorial disease, like arthritis, which is affected by several loci (and the environment) as well as those diseases inherited in a non-Mendelian fashion. A similar situation arises from codominance, in which the phenotypes produced by both alleles are clearly expressed. For example, in certain varieties of chicken, the allele for black feathers is codominant with the allele for white feathers. Heterozygous chickens have a color described as "erminette," speckled with black and white feathers. Unlike the blending of red and white colors in heterozygous four o'clocks, black and white colors appear separately in chickens. Many human genes, including one for a protein that controls cholesterol levels in the blood, show codominance, too. People with the heterozygous form of this gene produce two different forms of the protein, each with a different effect on cholesterol levels. ↑ E. B. Ford (1960). Mendelism and Evolution (seventh ed.). Methuen & Co (London), and John Wiley & Sons (New York). p. 1. ↑ See Mendel's paper in English: Gregor Mendel (1865). "Experiments in Plant Hybridization". 1 2 Bailey, Regina (5 November 2015). "Mendel's Law of Segregation". about education. About.com. Retrieved 2 February 2016. ↑ Bailey, Regina. "Independent Assortment". about education. About.com. Retrieved 24 February 2016. ↑ Perez, Nancy. "Meiosis". Retrieved 15 February 2007. Reece, Jane B., and Neil A. Campbell. "Mendel and the Gene Idea." Campbell Biology. 9th ed. Boston: Benjamin Cummings / Pearson Education, 2011. 265. Print.